The car plunged into a crowd of festival-goers in Chicano Park. Photo Credit: On Scene TV. 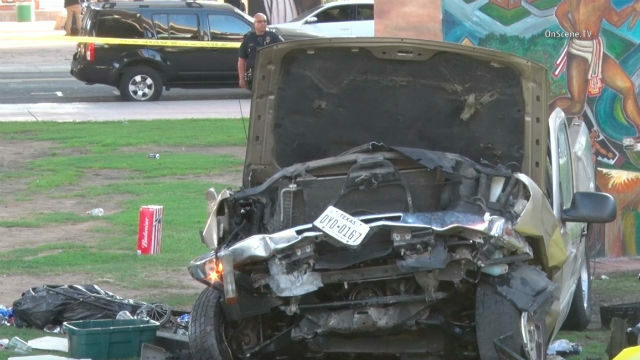 The driver of the pickup truck that plunged more than 60 feet into a crowded festival at Chicano Park, killing four people and injuring nine, was in custody Sunday. Richard Anthony Sepolio — a 25-year-old on-duty Navy serviceman stationed in Coronado — was arrested on a charge of driving under the influence, causing injury or death, according to the California Highway Patrol. Sepolio’s truck plunged off the Coronado Bridge and landed in the park, where hundreds of people were attending the La Raza biker festival, authorities said. Alcohol was involved, CHP spokesman Jake Sanchez said. According to a 10News report, investigators have used a curtain to surround an area where the truck landed. The GMC truck landed on its side on top of four people, according to Chief Brian Fennessy of San Diego Fire-Rescue. People attending the festival uprighted the badly damaged truck, Capt. Chuck Kaye of the San Diego Police Department said. Police officers gave medical aid to those crushed by the truck, but “but to no avail,” Kaye said. Sepolio suffered major trauma and is being treated for his injuries at UC San Diego Hospital, Sanchez said. Yadira Galindo, public information officer for UC San Diego Health System, said Sepolio’s medical condition would not be available, unless either he or the investigating authorities gave permission to release the information. The injured victims were taken to either UC San Diego or Scripps Mercy hospitals for treatment, said Lee Swanson, spokesperson for San Diego Fire-Rescue. All the injured victims are adults, authorities said. Their conditions also were unavailable. Sepolio — said to have been alone in the pickup that KUSI reported has Texas license plates — was southbound on Interstate 5, heading for the Coronado Bridge when he failed to make the transition and crashed, Swanson said. The crash caused so much chaos that both the Coronado and Harbor police departments were called in to help. A CHP officer told reporters no police officers were pursuing Sepolio before he crashed.